Mowing And Reaping Machines, mechanical devices for cutting grain or grass by animal power. Though this invention was suggested by the ancient Romans, the first experiments toward practical results were made in Europe in the latter part of the 18th and early part of the present century. The first machines, however, which attained to much efficiency were made in the United States between 1830 and 1850. 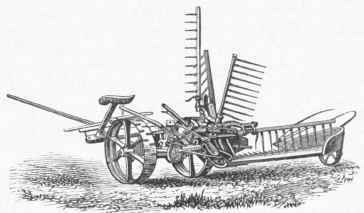 The first reaping machine on record was described about A. D. 60 by Pliny, who says that it was used on the plains of Rhaetia. It had the form of a cart with a comb-like bar in front, which stripped off the ears of wheat and delivered them into a box, the straw being allowed to stand. It was propelled by an ox that walked behind the machine. A similar implement is now in use for gathering clover seed, called a header. The forerunner of the present form of machines, in which the gatherers or cutters were given increased velocity, was one constructed by Pitt in 1786, in which a cylinder armed with combs plucked off the ears and discharged them into a box. For some time after this the cutters were made upon the rotary principle, the motive power being, as ever since, the bearing wheels. In 1822 a reciprocating or to and fro motion was given to the cutters. Nearly all the inventors attached the power behind, only four previous to 1823 placing it in front. In 1806 Gladstone of England patented a front-draft side-cut machine having a revolving knife. A bar with fingers gathered the standing grain and held it to the knife. Ogle in 1822 made the first reciprocating knife, which was also attached to a forward-draft machine. He used a reel to gather the grain to the cutter, and also a platform which was tilted to drop it in portions. Bell's machine (1826) had a reel and a travelling apron which carried off the grain to one side. The names of Adams of New York, Ten Eyck of New Jersey, and Lane of Maine are among the earliest connected with the invention of harvesters in the United States. In 1833 Obed Ilussey, then of Cincinnati, O., patented a machine to which he applied saw-toothed cutters and guards. This machine was at once put into practical operation. On July 12, 1837, a public exhibition of its operation, under the direction of the board of trustees of the Maryland agricultural society for the eastern shore of Maryland, gave great satisfaction. During the same season this machine cut in a satisfactory manner 180 acres of oats and barley on a farm in Maryland. The open-topped slotted finger was patented by Ilussey in 1847. In 1834 Cyrus McCormick of Virginia patented a reaper, which, having been improved in 1845 and again in 1847, received a medal at the world's fair in London in 1851. It had a sickle-edged sectional knife, reciprocating by crank movement with the bearing and drive wheels; there was a reel, and a divider was used on each end of the platform. The reaper had a seat behind the platform. The names of Haines, Ketchum, Manny, and Wood are prominent among inventors of improvements in mowers and harvesters. The practical use of self-rakers in this country dates from the invention of W. H. Seymour of New York in 1851, who arranged a quadrant-shaped platform directly behind the cutters, a reel to gather the grain, and a rake moving over the platform in the arc of a circle, depositing the sheaves on the ground. 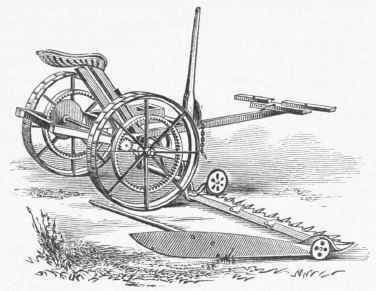 In 1856 Owen Dorsey of Maryland combined the reel and rake, and his improvement has been extensively used in this country and Europe, with some modifications, one of which was by Johnston in 1865, who arranged it so that the size of the sheaves, or gavels as they are called, could be regulated at the will of the driver. - Owing to the variety in form and the multiplicity of patented modifications of the several parts of the modern machines, and the impossibility of doing justice to all parties in an attempt to describe all the inventions within the limits of this article, we shall give a general description only of their construction and operation. These machines consist of a strong framework, so constructed as to support a driver's seat, the cutting mechanism, and, when used for harvesting grain, a platform on which the grain falls when cut, and from which it is raked as often as a sufficient quantity for a bundle has accumulated. This framework is somewhat longer than the width of the swath to be cut, which is usually 5 ft., and of sufficient width for the platform, say 3 ft., except when used for cutting grass, when the platform is dispensed with, as the mown grass is allowed to fall over the cutters directly upon the ground. On the front edge of the frame is the cutting apparatus, consisting of a series of iron guards or pointed fingers, which are permanently fastened to the frame and extend about 7 in. 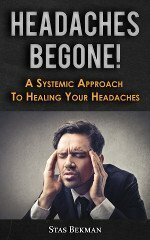 beyond its edge, parallel to each other, horizontal and pointing forward. They are about 3½ in. apart, and 1½ in. wide at the base, lessening toward the point. Each guard has a horizontal mortise through it, and being on a line with each other they all form a continuous horizontal mortise or slit through the whole line of guards. The cutters are formed of thin triangular plates of steel, fastened to a straight flat rod or plate of metal. These steel plates are arranged side by side, resembling a saw with teeth 3 in. wide at their base and 4 in. long, sharp on both sides, and terminating in a point. This saw or cutting plate is passed through the slits in the guards with the teeth pointing forward and their points coming even with the centres of the guards. One end of the saw is connected with a crank, which receives a rapid motion through intermediate cog wheels, from the tractive force and motion of the main or driving wheel. The framework with all its mechanism is supported by two or more wheels, the drive wheels being much larger than the others, and the axles so constructed as to admit of the platform, cutters, etc, being horizontal and suspended within a few inches of the ground. The pole is so attached to the framework as to allow the team to walk before the machine on the stubble of the last swath, while the platform with the cutters on its front edge extends on the right at right angles with the direction of the horses, so that the guards and cutters are presented to the standing grain or grass. A large reel, in front of and parallel with the series of cutters, is sometimes attached to the framework, and, being connected by a band or otherwise to the drive wheel, is made to revolve with it in the right direction to bend back the top of the standing grain or grass, past the cutters and over the platform, which tends to assist the cutting and to insure the backward fall of the grass upon the platform, or the ground in the rear of the machine. Some of the later machines, like the one shown in fig. 2, of which the " Champion " reaper of Springfield, O., is an example, have a sweep rake consisting of arms which, by means of a circular inclined plane, or stationary cam over which the heels of the arms are made to pass in revolving, become elevated when passing over the inner drive wheel, and lowered to the proper level when passing over the platform, so that the grain is gathered into parcels of a suitable size for sheaves. A seat for the driver is usually attached directly behind the team, above and over the outer drive wheel in the harvester, but in the mower it is usually between the two drive wheels. Some patents have been granted for machines for reaping and threshing grain at the same operation, and many for a binding apparatus as an attachment to the reaper; but the more simple machines are the ones in general use.